Highlighting my Mulholland ancestors from County Antrim, Ireland and those that immigrated to Los Angeles and Long Beach California, United States; and Sydney, New South Wales, Australia. I recently started writing again about my family history research. Today I am focussing my attention on my great grandmother Elizabeth McWilliams. Eliza Anne McWilliams was born on 3rd March, 1868 near Ballymena, at Aughaboy, Drummaul, County Antrim, Ireland. She married my great grandfather John Mulholland on 23rd December 1895 at St Anne's, Church of Ireland, Belfast. his brother William Geoffrey Mulholland born 11th July 1899. Elizabeth, John, and their two sons Joseph Cecil and William Geoffrey Mulholland arrived in Sydney, New South Wales, Australia aboard the Hororata on 11th August 1921. When I searched within Trove for "Elizabeth Mulholland" , many search results appeared, however, only two of the results are actually about my great grandmother. 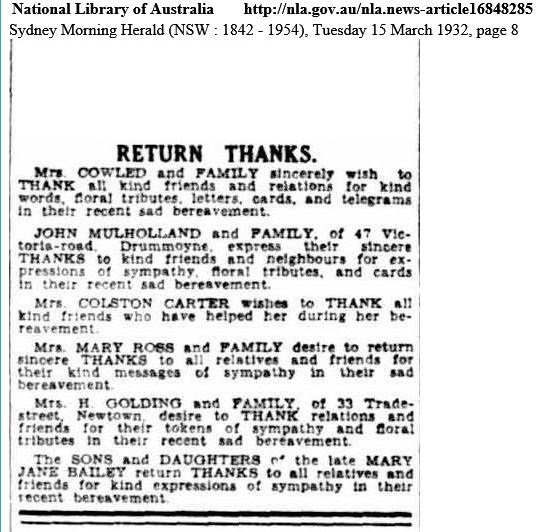 The first is a 'Funeral' notice and appears in column 4 of page 12, The Sydney Morning Herald on Saturday, 12th March 1932. Church of England Cemetery, Field of Mars. 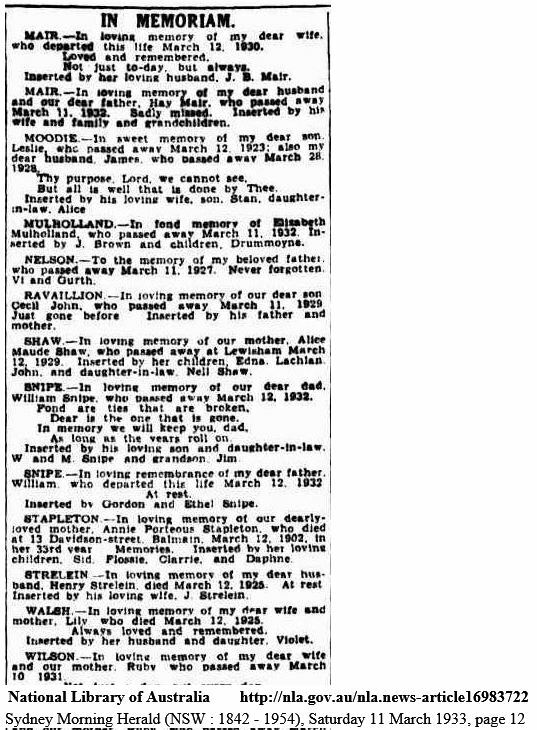 The second search result is an 'In Memorium' notice which appears in column 3, page 12, The Sydney Morning Herald on Saturday, 11th March 1933.
serted bv J Brown and children Drummoyne. in their recent sad bereavement. Whilst I did not find many newspaper articles about my great grandmother, I am happy that I have at least found these. Ireland, Department of Arts, Heritage, Regional, Rural and Gaeltacht Affairs. "Civil Records", database, and digital images, IrishGenealogie.ie, (https://www.irishgenealogy.ie : accessed 16 September 2016), birth entry for Eliza Anne McWilliams (3 March 1868), Superintendent Registrar's District Ballymena, Registrar's District Toome, Group Registration ID (GRID) 8236526 p.167, no. 231. Ireland, General Register Office, Marriage Certificates, St Anne's, Belfast, County Antrim, Vol. 1, p. 310, no. 41, 23 December 1895, John Mulholland & Elizabeth M'Williams; General Register Office, Ireland, 3rd Floor, Block 7, Irish Life Centre, Lower Abbey Street, Dublin 1, County Dublin, Ireland. Ireland, Department of Arts, Heritage, Regional, Rural and Gaeltacht Affairs. "Civil Records", database, and digital images, IrishGenealogie.ie, (https://www.irishgenealogy.ie : accessed 20 January 2018), birth entry for _____ Mulholland (22 October 1896), Superintendent Registrar's District Belfast, Registrar's District Belfast Urban No 4, Group Registration ID (GRID) 8534363, p.258, no. 179. Northern Ireland, General Registry Office, Birth Certificates, No. 1897-787-BK74-014, 4 September 1897, Joseph Cecil Mulholland; General Registry Office, Northern Ireland. Ireland, General Register Office, Birth Certificates, No. 407, 11 July 1899, William Geoffrey Mulholland; General Register Office, Ireland, 3rd Floor, Block 7, Irish Life Centre, Lower Abbey Street, Dublin 1, County Dublin, Ireland. "Elizabeth Mulholland", The Sydney Morning Herald (Sydney, NSW, Australia : 1842 - 1954), 12 March 1932, p. 12, col. 4, funeral; digital images, National Library of Australia, Trove (http://trove.nla.gov.au/newspaper/article/16983722 : accessed 27 August 2013). "Elizabeth Mulholland", The Sydney Morning Herald (Sydney, NSW, Australia : 1842 - 1954), 11 March 1933, p.12, col.3, In Memorium; digital images, National Library of Australia, Trove (http://trove.nla.gov.au/newspaper/article/16983722 : accessed 27 August 2013). "JOHN MULHOLLAND and FAMILY", The Sydney Morning Herald (Sydney, NSW, Australia : 1842 - 1954), 15 March 1932, p. 8, col. 2, return thanks; digital images, National Library of Australia, Trove (http://nla.gov.au/nla.news-article16848285 : accessed 23 July 2012).